By trails end, Lewis and Clark had described 178 plants and 122 animals previously unrecorded for science.
" there are several species of fir in this neighborhood which I shall describe as well as my slender botanical skill will enable me... grows to immense size; very commonly 27 feet in the girth six feet above the surface of the earth, and in several instances we have found them as much as 36 feet in the girth or 12 feet diameter perfectly solid and entire. they frequently rise to the height of 230 feet, and one hundred and twenty or 30 of that height without a limb." Modern-day explorers can view a Giant Sitka at Klootchy Creek Park, Oregon. 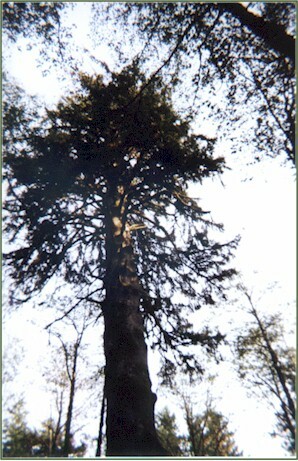 Klootchy Creek Giant - aka the Seaside Spruce- is a Sitka Spruce that stands 216 feet tall, measures 56 feet in circumference and has a crown that spreads 93 feet. That makes if the biggest tree in the State of Oregon and the biggest Sitka Spruce in the Country. The Klootchy giant has been named Oregon's first Heritage Tree, a program that recognizes trees for their connection to Oregon History. Klootchy Creek Giant is located southeast of Seaside, Oregon on Highway 26 .